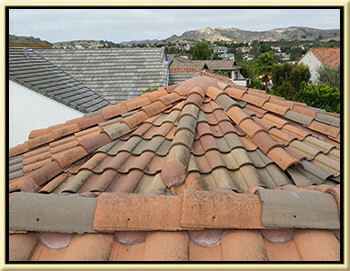 South County Roofing is a roof repair only roofing company located in Lake Forest, Ca 92630. We inspect and repairs jobs in both Newport Beach and Newport Coast. If you are in need of roof leak repair, some roofing maintenance or just need a couple of broken roofing tiles repair then, you are in the right place. We are completely licensed with 1 Million dollar Workers Compensation and 2 Million dollar general Liability. We do not cut corner when it comes to insurance. Even though the state of California does not require General Liability Insurance we have it anyways for you and our piece of mind. You should not be having just anyone out to inspect your tile roof. Some roofer's are too heavy to walk on delicate light weight tile roofs. The roofer who gets up on your tile roof should be on the smaller size, in great shape, younger, experienced, and very well trained. Where are you going to get that? Here! Hire us to fix your tile roof and we will fit the bill. 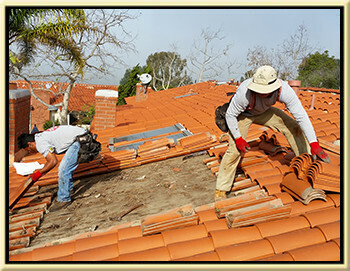 All of our roofers are skilled workers and we don't hired laborer or sub-contractors to do our repairs. We take great pride in our appearance, our work, and most of all our customers. Do you have a problem with birds making a mess all over your roof? We have a solution for you. You can schedule to have us come out to your home and see the problem first hand. We order and install stainless steel bird spikes on your roof to remove pesky birds from your roof top. Customers who install bird spikes on a particular area on their roof can expect bird to NOT go there anymore. This will help keep your roof clean and keep unwanted birds off your roof. 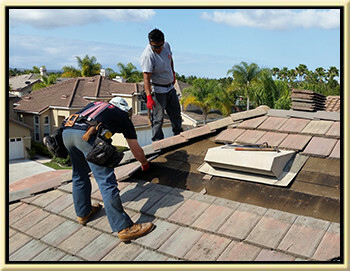 Seems how we are often fixing roofs in Laguna Beach and Newport Coast we can quickly make an appointment for you to get your roof repaired. Have you been told by your neighbor that you have slipped or loose tiles on your roof? This is not uncommon because certain areas of your roof can only be seen from your neighbors house. We often get calls from customers who have been informed by a neighbor or home inspector that they have loose or even missing tiles. No matter how your tiles got loose or are missing a simple inspection from us can help identify why this is happening and we can quickly fix the roof to keep more tiles from coming loose or falling off. High winds can be especially damaging to Spanish Roofing and Clay tile roofs and much of Newport Beach gets high winds coming from the Pacific Ocean. Much to the surprise to most home owners but, not all your roofing tiles are secured by a nail or fastener. Some are actually only held in place by a very low quality sealant or adhesive. If you suspect you have some loose or wind damaged tiles then give us a call. We can check to make sure the roofing tiles on your roof are not loose or missing. In the advent we find inadequate adhesive, missing adhesive, or missing tiles we can make quick repairs of that. If you are experiencing a roof leak and want to have someone fix it correctly for the long term then you are in the right place. South County Roofing specializes in roof leak detection and repair. We know how to expertly remove small sections of the roof in order to find and properly repair your damaging roof leak. Roof leaks not repaired correctly often leak majorly and you may not know that your roof is still leaking for years to come. That won't be the case with us. We will take the time to strip the roof down to the deck, check and inspect the deck, make any needed repairs to the deck to repair dry rot or any mold damage as a result of the leaking roof. We will find the leak, photograph the leak, circle the leak on the plywood with a blue crayon, and make sure it is fixed for good. Call Us now and get your roof fixed tomorrow. Have you been informed from your home inspector that you need a roof inspection? We can help with that. The owner does the roof inspections himself and he has the experience and patience to properly and thoroughly perform the roof inspection. Our inspections include going through the interior of the home to look for any damaged ceiling or repairs that could have been caused by past or active roof leaks. Any water damaged ceiling we find will be checked with a thermo graphic imaging device to check to see if moisture is present. We will thoroughly check the eave for signs of a leaking roof. We will then walk the entire roof and check everything you need checked and take photos of anything of interest. We finish up the roof inspection with a professionally done roof inspect report with a total of four detailed pages. This report is done to clearly define what is wrong, where it is, and how much it should cost to be repaired. If after your receive you want us to correct the roof problem as outline in the report we will discount have the cost of the inspection. Hire us to inspect your roof and our roof inspection will pay for itself.